Granite is a highly durable surface material. Still, much like anything else, it will take some damage as time progresses. It's only natural, especially in the home's busiest room: your kitchen. Chips, cracks, dents, splits, and other damage can occur to your granite, leaving the countertop looking less than preferable. Specializing in granite repair in NYC, we've seen it all. Some surfaces only needed a simple polish, whereas others had so much damage that the client thought it was unrepairable. Before long, they were amazed at how clean and solid their granite looked. They were convinced we installed a new slab while they weren't looking. No, this is only a testimony of how much we value granite and how easy the surface is restored. Statewide Stone Care restores granite to its former, more beautiful state. 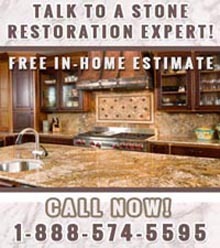 With our granite repair in NYC, you benefit from prompt and attentive service, affordable prices, and stunning results. So often we hear our customers say that they think they should replace their granite; that it's suffered too many cracks and dents. We accept these challenges and often amaze our customers when we rejuvenate their granite. You may be looking at your counters right now and wondering how it's possible granite repair in NYC can have any effect. Don't panic, it's never too late for this highly versatile natural stone. Our team will come take a look at the surface for an overall assessment before breaking down the steps we'll take to get your kitchen shining like it was the day everything was installed. Our expert team is trained in all the nuances and delicacy of dealing with granite and other natural stone. Whether you have marble, quartz, cambria, silestone, or another similar material, we can promise you a brand new kitchen, at a fraction of what you paid for the initial installation. If only all surfaces were invincible. The only way you can be sure that your countertops remain in pristine shape is to never use them. But of course, that's impossible when referencing your kitchen. But there is one more solution: giving us a call for granite repair in NYC. It's never too late as granite has a lifespan beyond it's surface scratches. For more information about granite repair in NYC, call Statewide Stone Care at (888) 574-5595.